Here’s to a fresh new week everyone! Last week was a bit on the stressful side so I’m glad to be moving on. Speaking of which, somehow we’re already 10 days into September, how did that happen? Even though I’m already playing catch-up I figured I’d better stick to sharing my August Wear Count or I might fall out of the routine I’ve been in and enoying. Plus, these outfits are some of my favourites yet! If you’re wondering what this ‘wear count’ thing is, it’s essentially exactly what it sounds like. 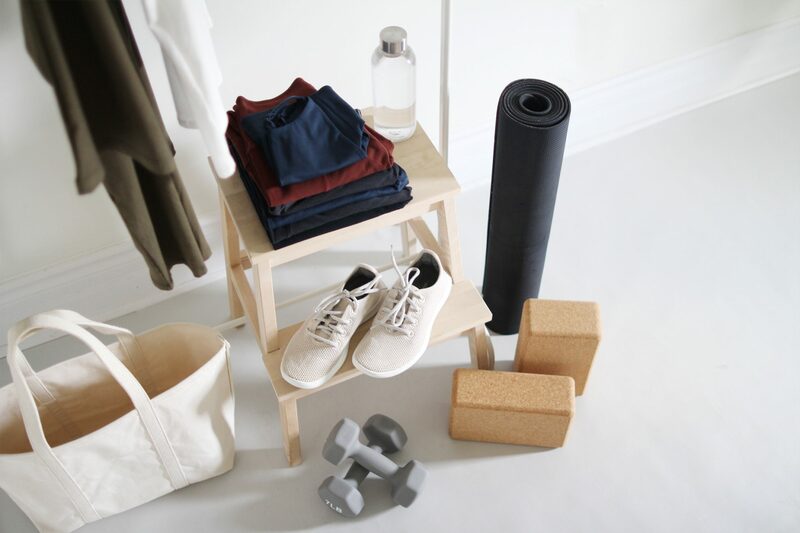 I have simply been counting how many times I wear an item and the exercise has been a great way to get some real data on my closet performance. I started keeping track during my time in Vancouver this spring and you can get caught up with my West Coast Wear Count Part 1 and Part 2 as well as my July Wear Count if you’re interested. For today’s post I’ve got my most worn items from August along with some brief findings and 6 new outfits I wore during the month. 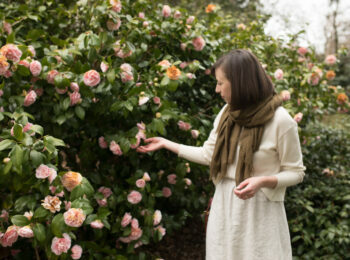 I’ve added my thoughts on each one and the occasions for which I wore them as well. 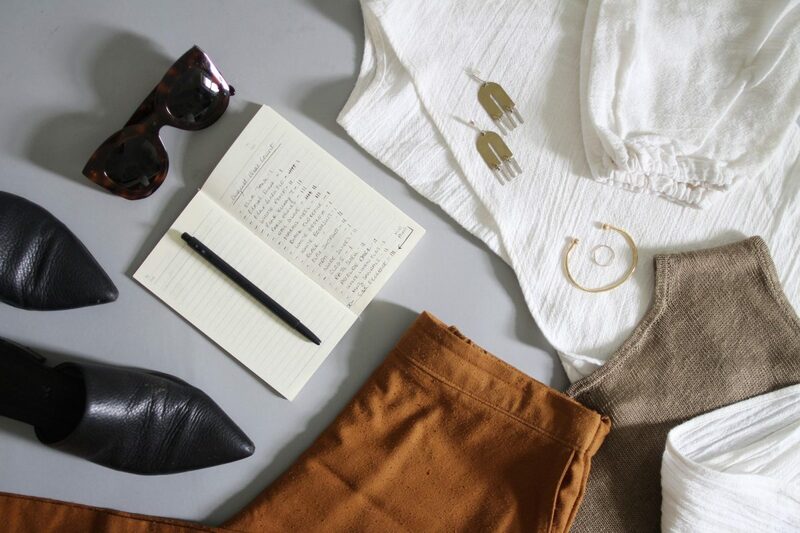 Additionally, since we’re into a seasonal transition, I thought it would be fun to include a few notes on what I’d change to make each look a little more fall-friendly. It’s Monday, you’re busy, so let’s dig right in shall we? BY DAY 10 – I had worn 20 different items already, which is 5 less than last month. BY DAY 25 – I had worn 33 different items, which showed that my count was slowing down a with so many pieces already in rotation. 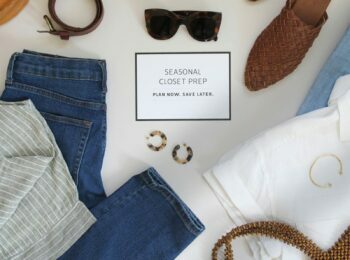 BY THE END OF THE MONTH – I had worn 45 items. This was the same number as last month which is interesting! Not sure what that means but I am keeping it in mind. 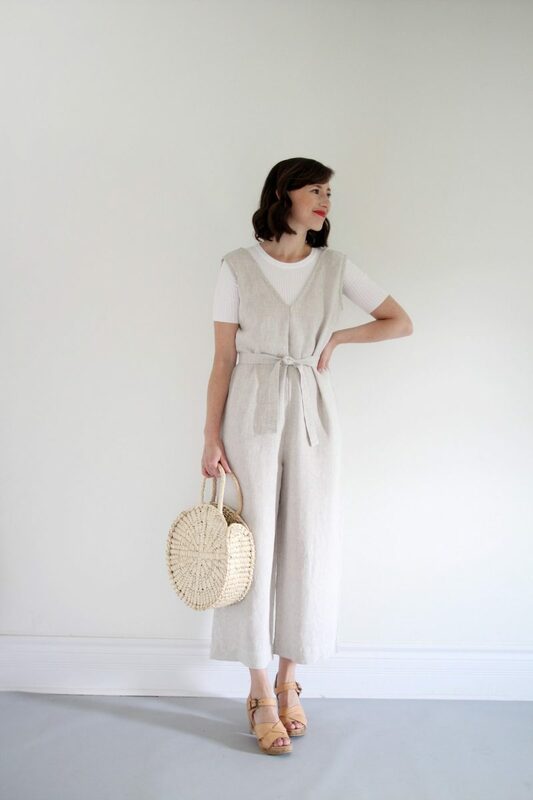 THE NUMBERS OVERALL – I found that my count per item was lower in general but I wore most pieces at least a couple of times whereas the month before was a bit more skewed towards certain items being worn a lot and many being worn only once. WEATHER – August’s weather was still quite hot but dipped down a few times giving me a chance to wear some of my long coats. I won’t lie, that got me very excited! It was also nice to breathe a sigh of relief from some crazy humidity. Getting dressed when it’s cooler out is definitely more within my style wheelhouse. 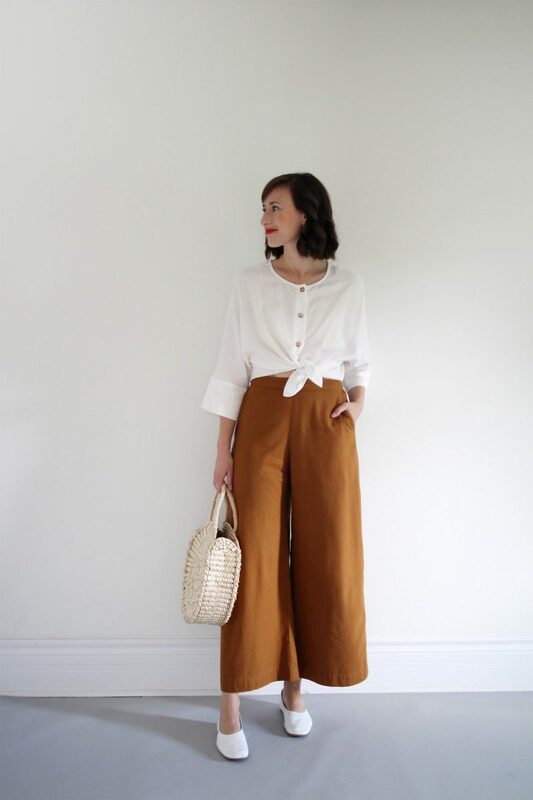 INITIAL THOUGHTS: This is one of my favourite uniforms of the summer: a button-down, tied in a knot, over a pair of high rise pants with flats and a woven bag. 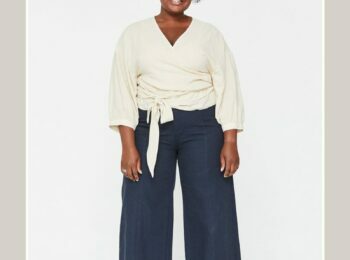 In this case I opted for the Boxy Top from VETTA front knotted over the Wide Leg Pant from Jamie + the Jones (aka: my latest obsession). 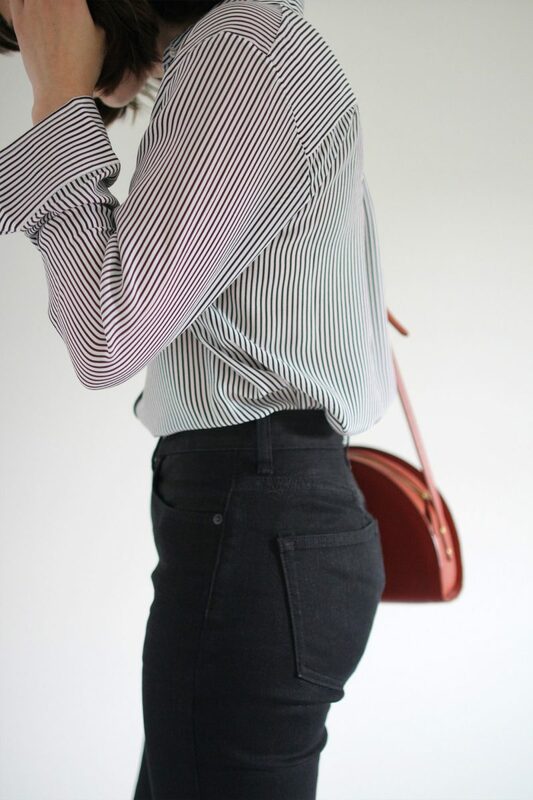 I love how this combination comes together for a simply styled, slightly flirty but entirely comfortable outfit that’s great for running around and getting things done! 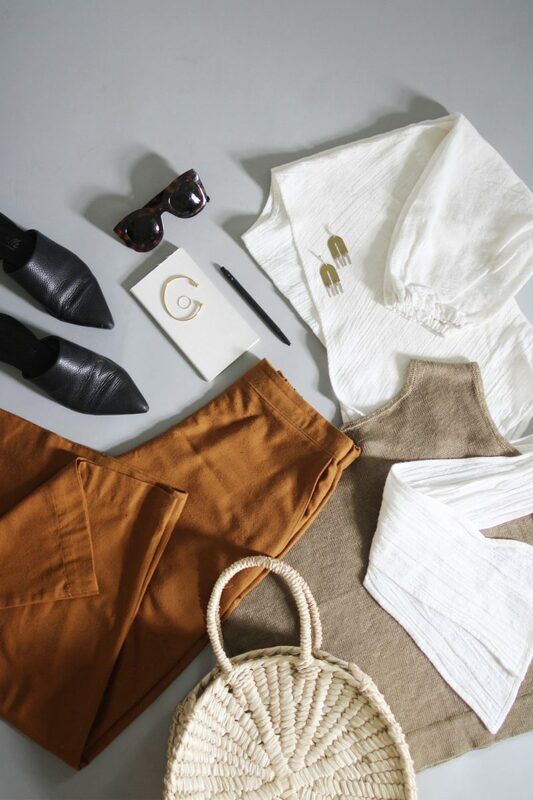 I’m also really feeling this colour palette for a later-summer/early-fall vibe. 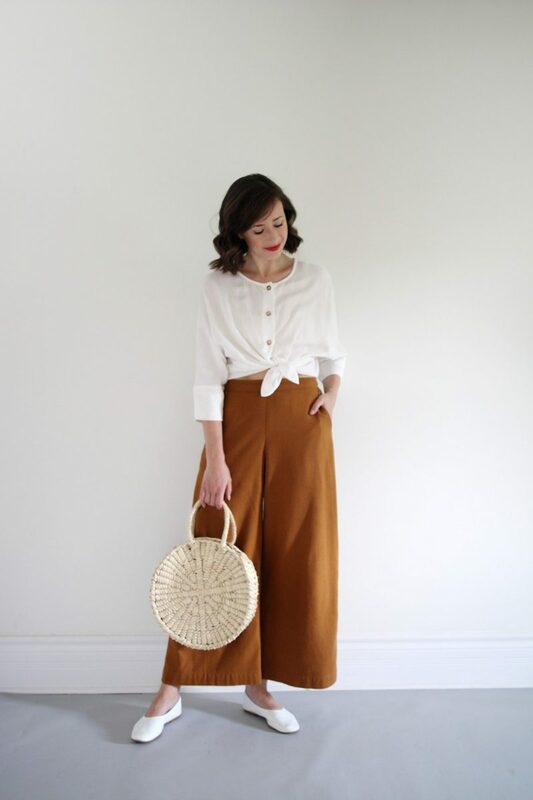 The crisp white top and shoes are fairly seasonless but the tan buttons and umber pants bring the warm autumn tones while a straw bag and bright lip colour have that playful summer feel. WHERE I WORE IT: I wore this one to a breakfast date with a dear friend, some errands around town and a busy day of work in the office. 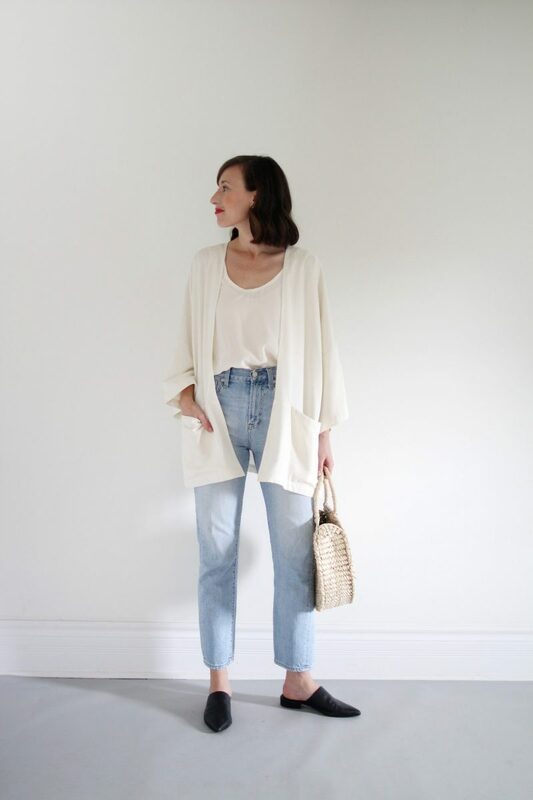 HOW TO MAKE IT FALL FRIENDLY: I’d swap the flats for black ankle boots, spin the top around and front tuck the hem and add my denim duster or long cardigan for a top layer. Then I’d also swap the straw bag for a leather one instead. Et voila! INITIAL THOUGHTS: I really enjoy layering tones of white especially when they’re in different materials. The Ella Tank has been one of my go-to base layers this summer and it’s perfect under an open front jacket like the super soft raw silk Haori. 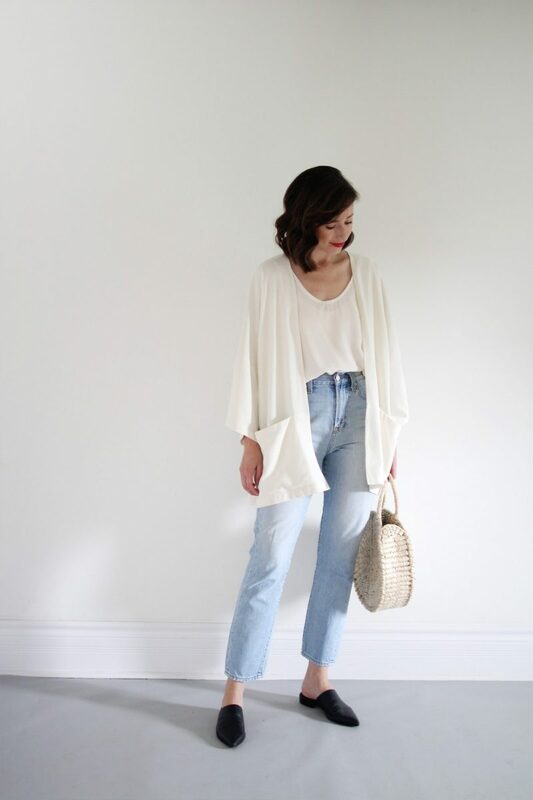 Off-white and light wash jeans are another fail-safe colour combo I enjoy wearing in the summer because it always feels elegant and relaxed at the same time. 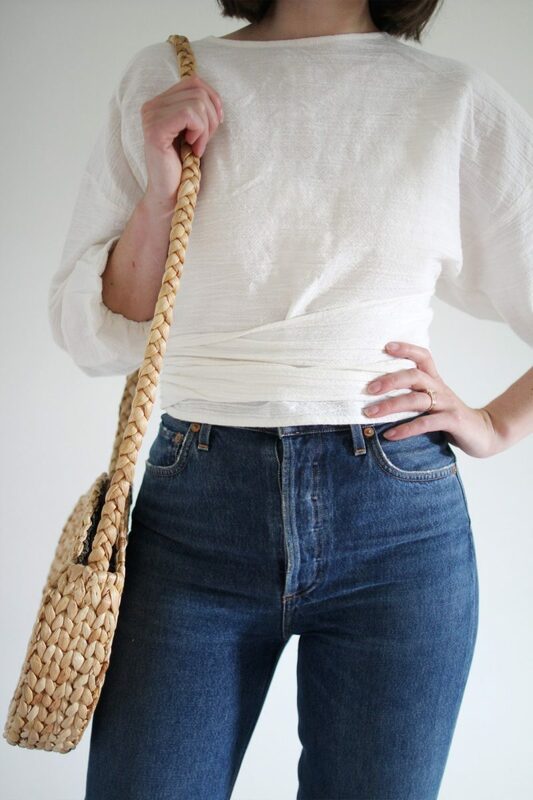 Adding a straw bag (don’t worry I’ll switch my accessories up soon enough!) continued the light tones and natural textures while a pair of black mules grounded the look and gave it just a tiny touch of toughness. 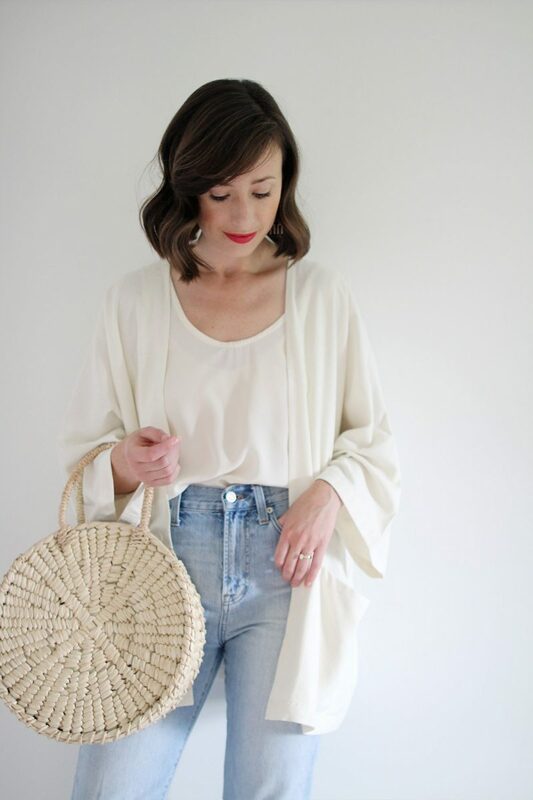 WHERE I WORE IT: I wore this one to wine night with the girls and it was perfect for a warm summer evening and a glass (or a few) of vino! 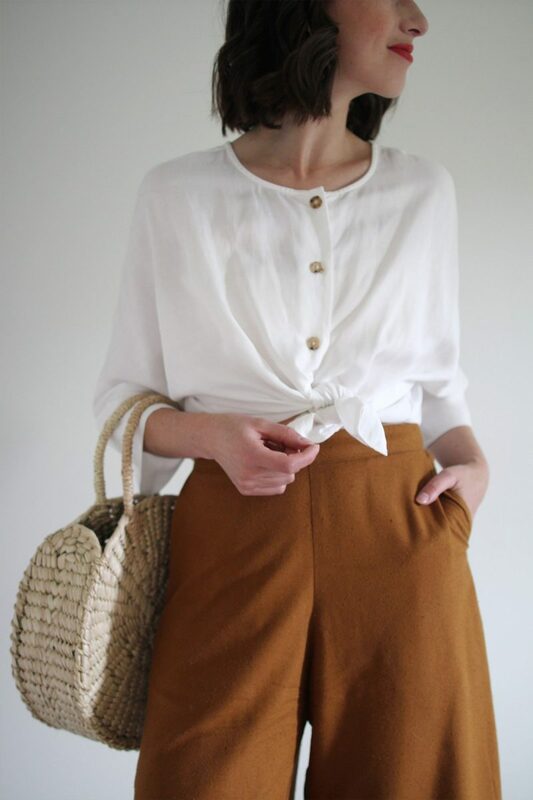 HOW TO MAKE IT FALL FRIENDLY: I could easily just add a scarf and grab a leather bag instead to make this fall-ready. But if I wanted to wear it for considerably cooler weather, I’d switch to boots, swap the tank for a long sleeve sweater and grab a knitted beanie! 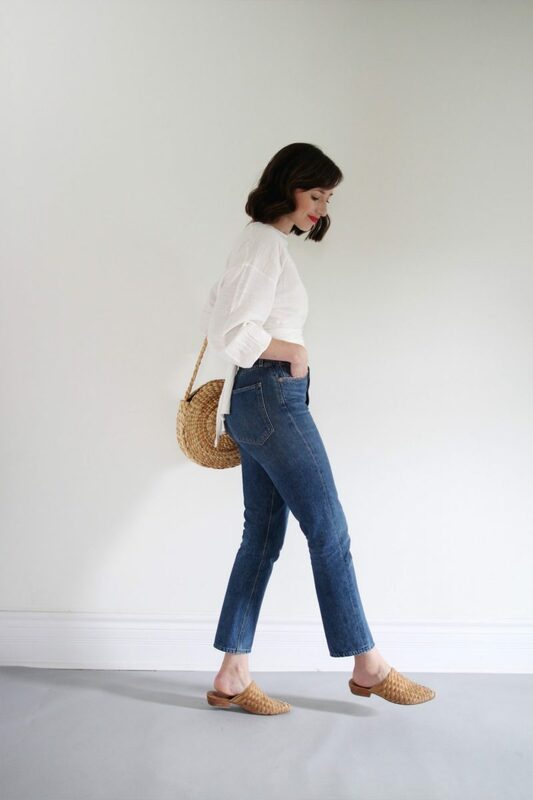 SUMMER JEANS from Madewell | $138 CAD | *Similar pair made responsibly here. INITIAL THOUGHTS: This one feels a bit more ‘mainstream’ than my usual style but a button-down and jeans is timeless none-the-less. I’m still so happy with this silk shirt. 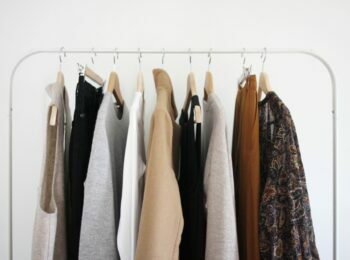 It has integrated really easily into my closet and I’m still finding lots of ways to style it. Ordering a size up was a good decision because it has an oversized look that feels more relaxed than a fitted shirt would in this scenario. I’m keeping that trick in mind for future top acquisitions too! 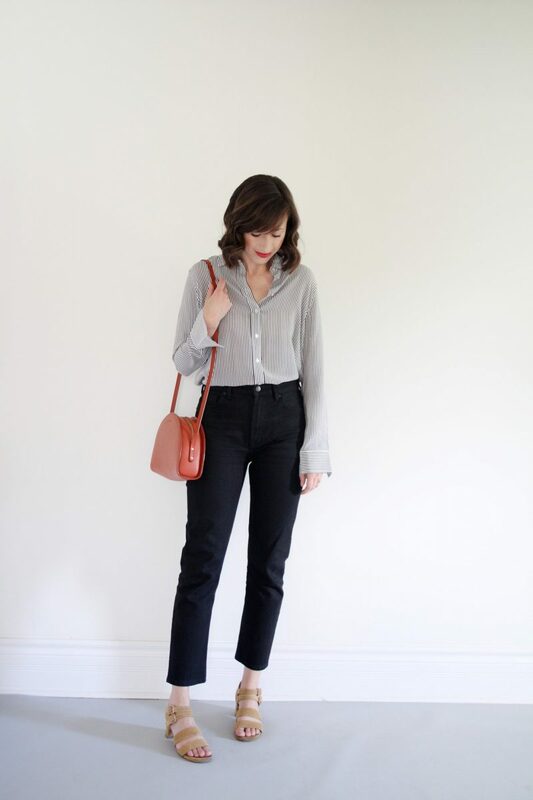 These jeans are one of my favourite pairs and I was sad to see that the original boyfriend fit is no longer available on Everlane. That said, I am intrigued by the authentic stretch cigarette because it looks similar to how I had these tailored to fit but a bit more figure-flattering. Do you think you’ll try out any authentic stretch denim styles? 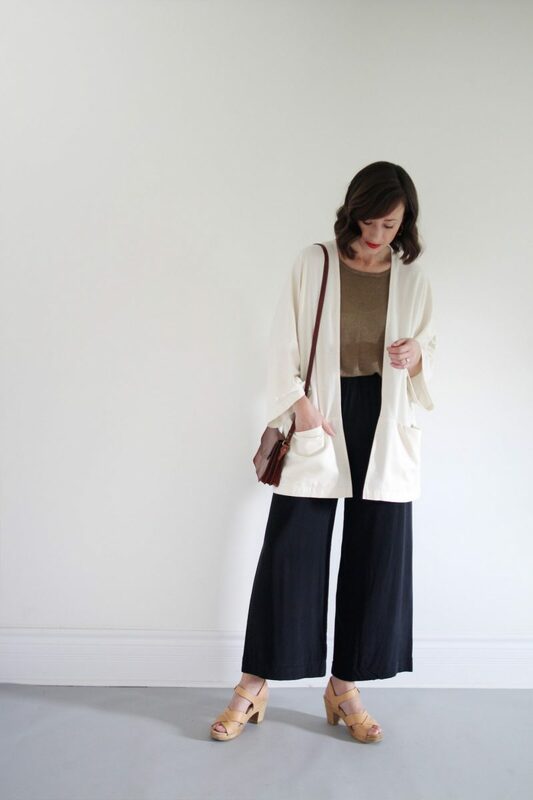 WHERE I WORE IT: This was perfect for a celebratory dinner out with Dave after delivering on a design project. 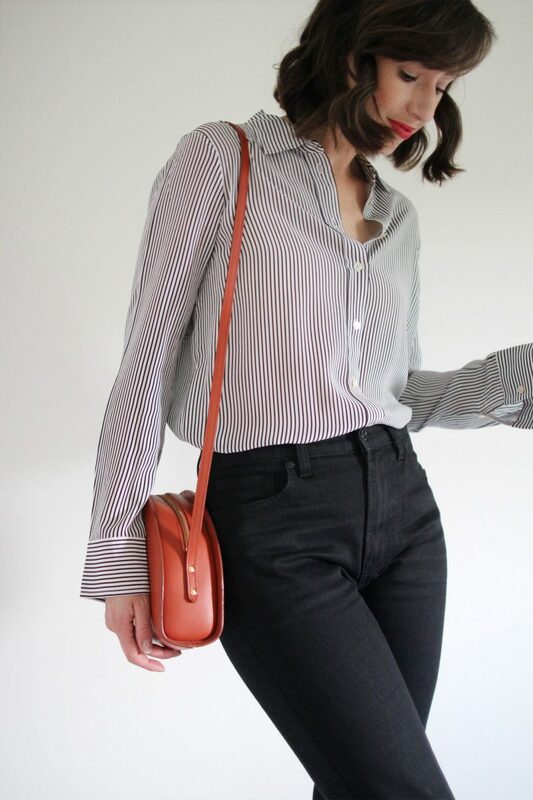 I was feeling the need for something a little bit on the professional side with a few fun flares like, stripes, suede sandals and red bag. 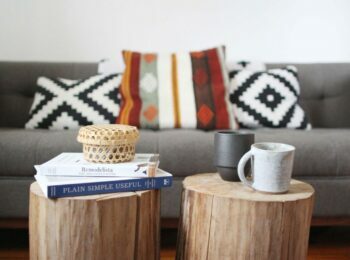 HOW TO MAKE IT FALL FRIENDLY: This one is a cinch to make fall-friendly. I’d simply throw on my denim jacket or a blazer and grab a pair of leather loafers (actually, I just wore this pair yesterday). INITIAL THOUGHTS: I felt very much at home in this one. 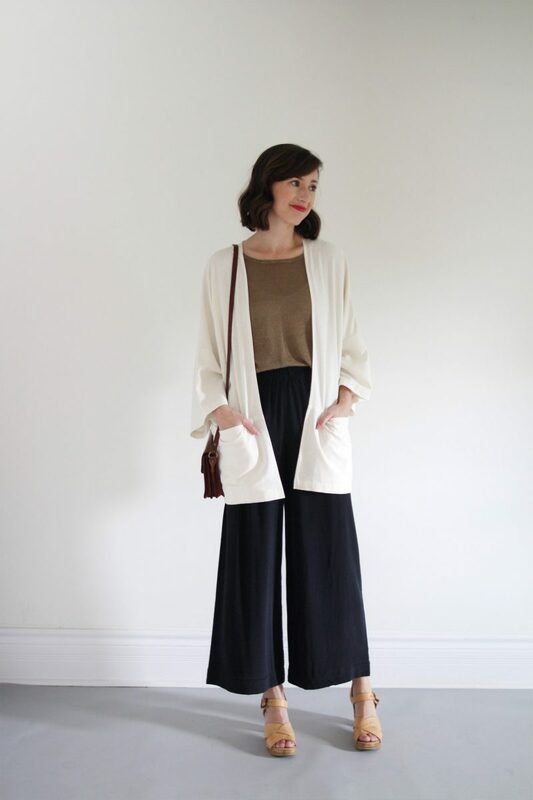 Soft layers in easy fits with lots of movement has long been a go-to favourite of mine. 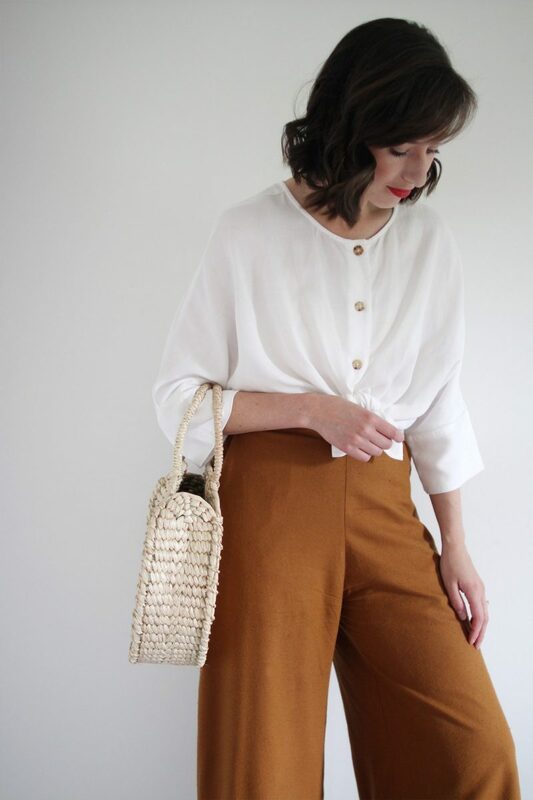 This colour palette has a nice transitional season feel to it too with the muted olive top, oxblood bag and natural leather sandals. I decided to give my clogs another chance again even though they’ve been shelf bound for much of the summer. 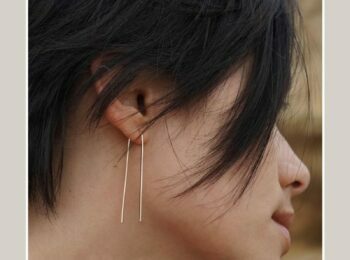 I can’t wear them all day but they’re great for an evening out or meeting that won’t require too much walking. WHERE I WORE IT: I wore this one to a design consultation and it was my attempt at an after-hours but still put-together outfit since the meeting was in the evening. It was so comfortable and I felt sophisticated but not over-the-top professional which can sometimes feel unnatural and counter-acts my confidence when meeting new people in a working environment. Introvert central right here! HOW TO MAKE IT FALL FRIENDLY: I’d switch my clogs for my new suede ankle boots and slide into my capote coat for an ultra soft and cozy fall get-up. INITIAL THOUGHTS: This is the first time you’ll have seen this jumper on the blog but it’s been in my closet for a couple of months now. At first I wasn’t sure it would work for me (hence why it stayed hidden) but I had the shoulders taken up about 1.5 inches in hopes that they wouldn’t slide off all the time. The fit still isn’t perfect but over a base layer like a ribbed tee they stay in place pretty well. Aside from some slight fit frustrations this outfit was my favourite one this month. 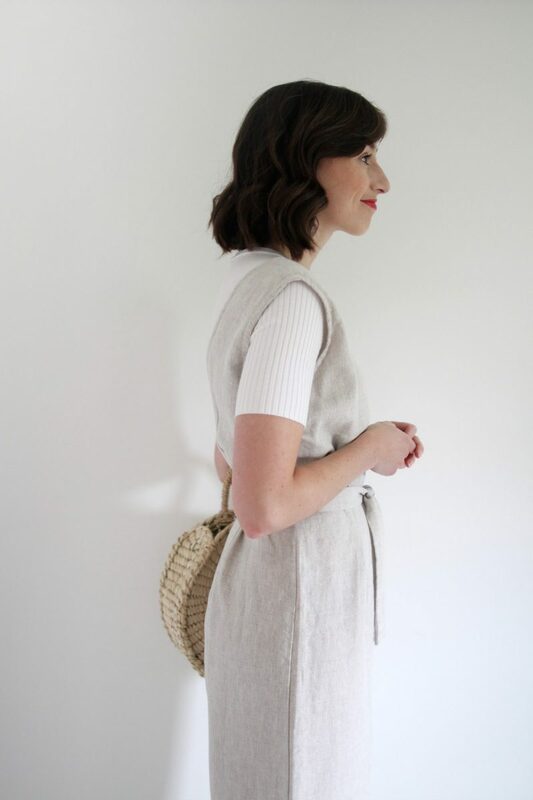 I love the look of a jumper layered over a ribbed tee (especially with slightly longer sleeves like this) and the natural textures in my accessories tpaired really nicely with the flax linen. It was one of my final truly ‘summery’ outfits and I dare say I ended the season on a good note! WHERE I WORE IT: This one made an appearance a couple of times during August but I first wore it to the antique market! 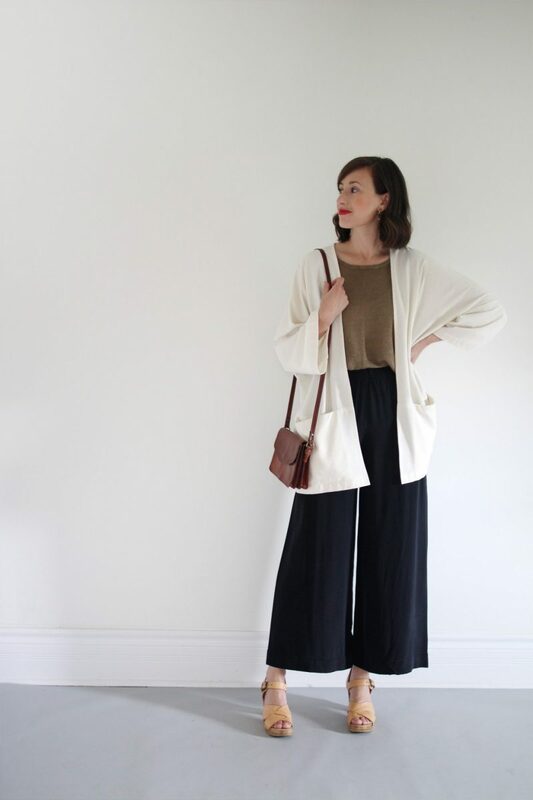 HOW TO MAKE IT FALL FRIENDLY: I’d switch my clogs for my new suede ankle boots (again) and grab my Harper Jacket in either cotton canvas or linen depending on the temperature because I think either one would work really well. BODYSUIT from Bodysuit of Barcelona (sold out) | Similar tee option here. 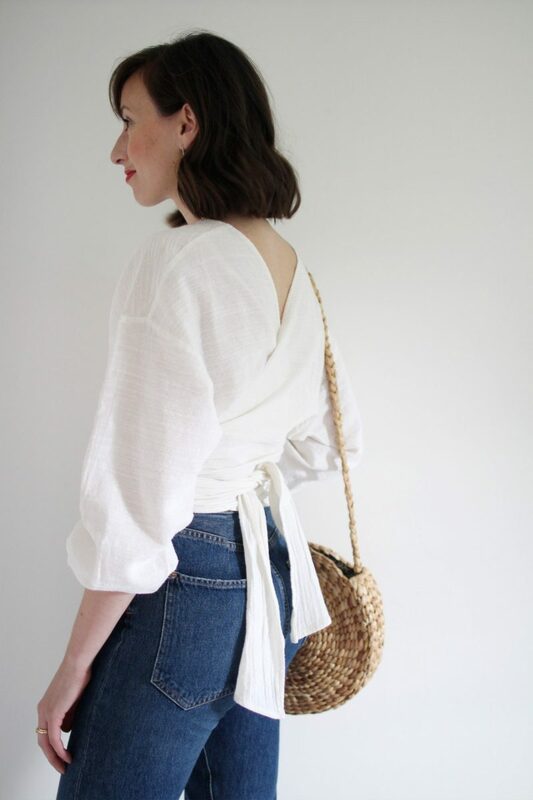 INITIAL THOUGHTS: This top is an example of how one of your favourite items might not get worn a ton but that doesn’t mean it hasn’t earned its keep. Even though this one has only been worn about 8 or so times since I got it last winter, it stands out as a star piece in my mind. Every single time I wear it I feel fabulous! It’s the piece I reach for whenever I have an occasion that calls for a little bit of drama and I’m looking to up the ante on my style while still staying comfortable and true to myself. Until now I hadn’t tried it with these jeans and these accessories but I like how they’re working together. 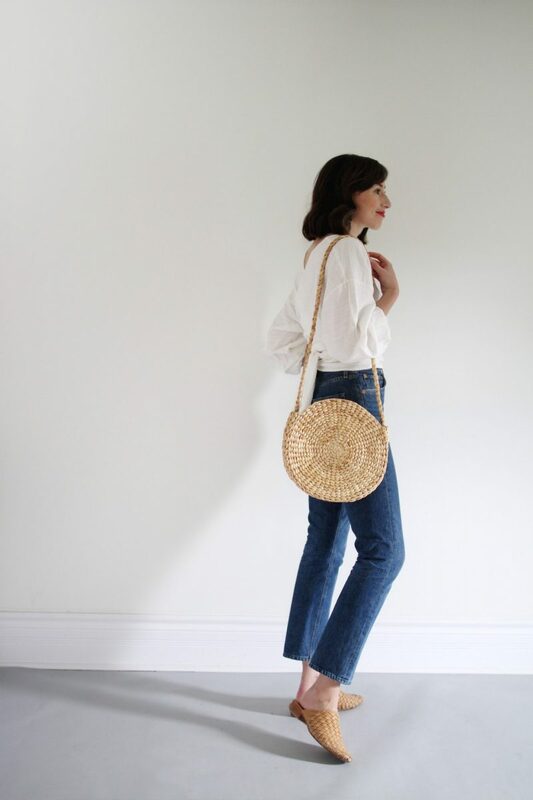 I love the contrast between the uber feminine top and the utilitarian denim and how the woven texture of the bag and shoes gives the look continuity. I’ll definitely be keeping this one in mind for future occasions! 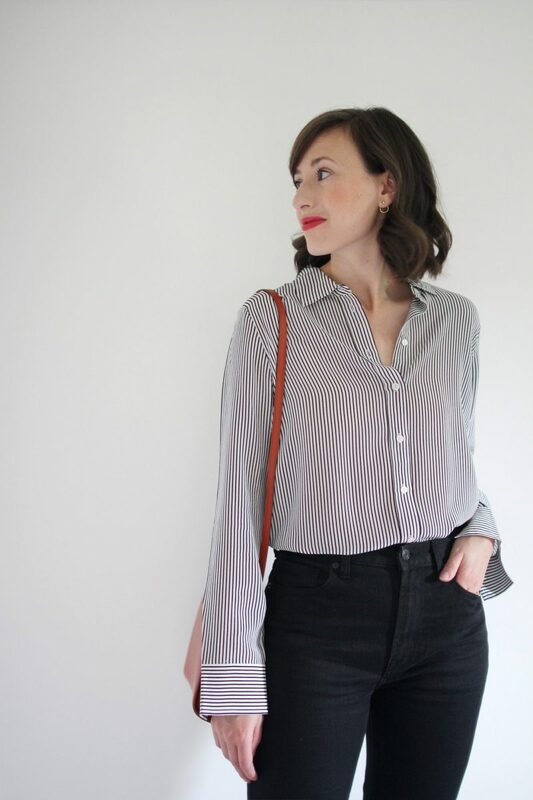 WHERE I WORE IT: I never actually wore this one exactly as shown but when I was planning out looks for this round up I couldn’t help but share it! 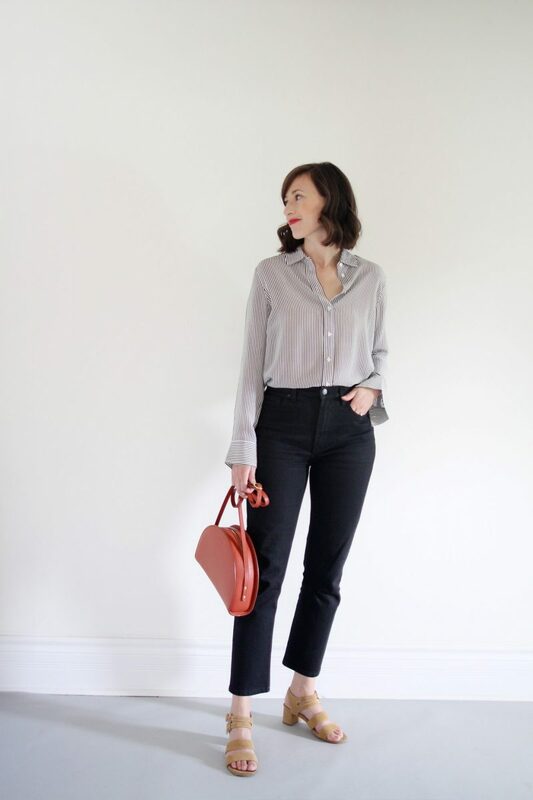 HOW TO MAKE IT FALL FRIENDLY: I’d slide out of these mules and into my Boss Boots and layer my black wool cocoon coat (seen at the end of this post) on top for a classic black, white and denim vibe. Then I’d add a brown tote to warm things up! THAT’S IT FOR MY AUGUST WEAR COUNT! DO YOU HAVE A FAVOURITE LOOK? WHAT WERE YOUR MOST WORN PIECES FROM AUGUST? I’D LOVE TO KNOW! Funny you mention having to take up the shoulders of your jumpsuit. I had to do the same with my Vetta Aaron jumpsuit (which I love love love now that it stays on). Who are these long-torsoed people who need all that length? I love that Haori jacket! Do you mind mentioning what size you purchased? I am really into it but am only 5’2″ so am in doubt about what size to order! I adore these wear count posts! 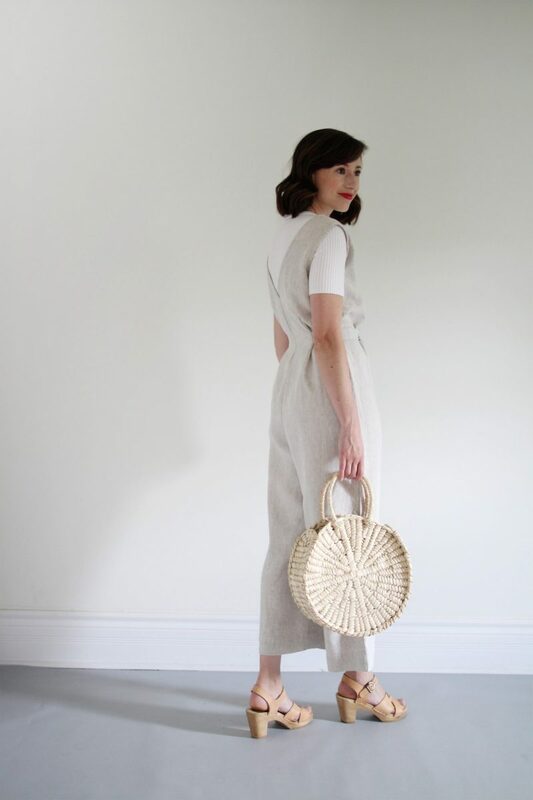 Love love love the Mara jumpsuit. I’d love to see a separate post/review of this item. Absolutely loving reading these posts about wear count! 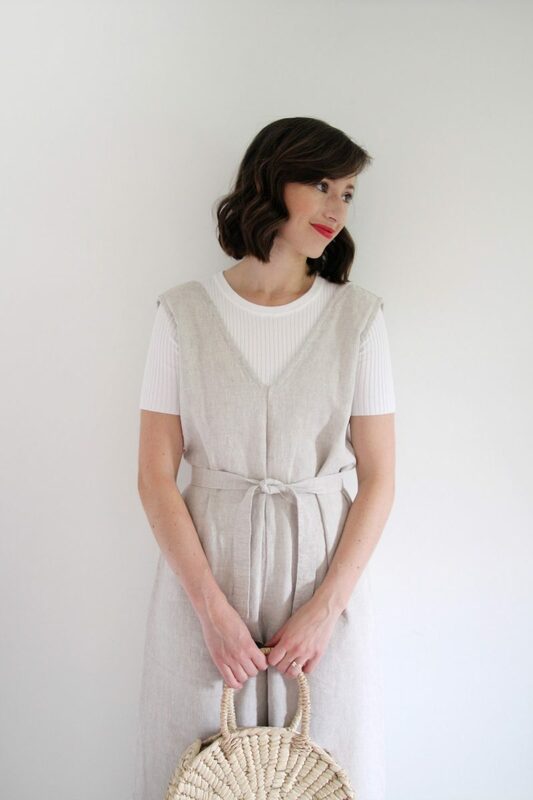 It also makes me super excited to get my Mara jumpsuit in the mail next week, fingers crossed, and try styling it for the fall. So happy to read that Rae! Thanks so much! 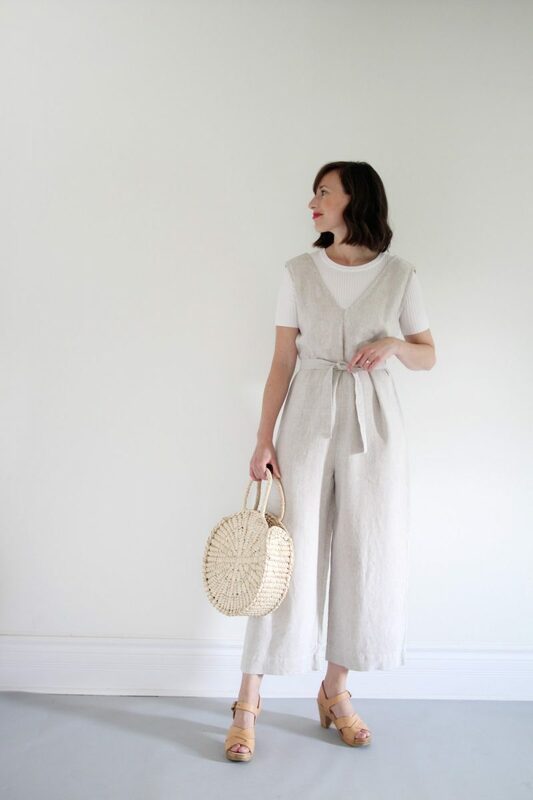 I hope you love your new Mara Jumpsuit, it’s a great piece. I’m wearing the MIEL Sisters Nana Bra in Sand Tropez (it’s probably my favourite bra). It’s a bit lighter than I’d really like (the Bare colour might be better) but I have also worn the White Rabbit Ann bralette and it doesn’t show through much at all. To be 100% honest, I haven’t found a bra that’s perfect under my light and silk camis but these are the two I wear most often. I hope that helps! Honestly, I love all of your looks! The ‘wear count’ proves the value you get from your clothing purchases. Plus, tracking your clothing must be a good reminder of what outfits worked well and which ones didn’t. I did start documenting my outfits, which I must admit didn’t last long., so good for you for keeping it up! 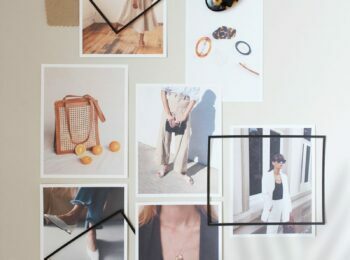 Your blog has been a great inspiration for my updating my summer wardrobe. 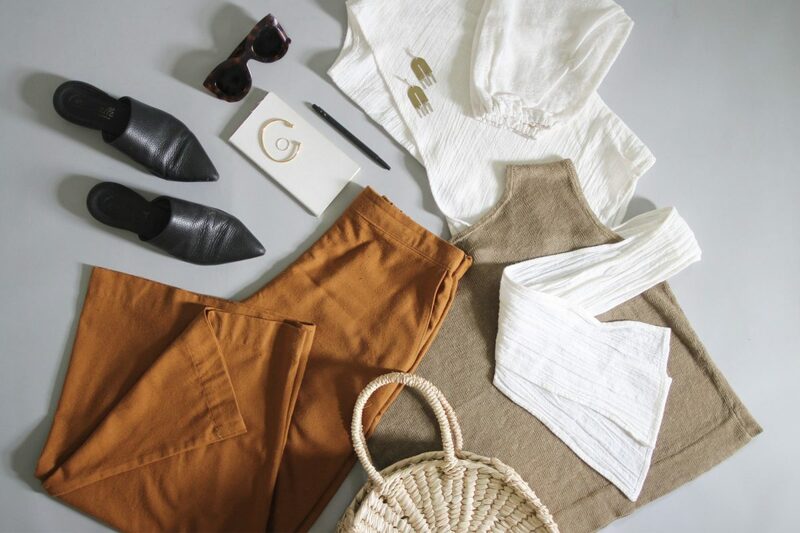 I am looking forward to seeing what your fall wardrobe will look like, so I appreciate your outfit tips on “How to make it fall-friendly!” Have a great week! Look 4 is my favorite and this is my favorite post since the July Wear Count . 🙂 I’ve never done a wear count. I don’t know why. It seems like something my left-sided brain would like to do, but it seems too tedious. But I really enjoy reading your results. I still haven’t made any purchases from my Fall wish list. Maybe this week….